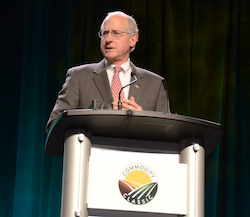 Chairman of the House Committee on Agriculture Mike Conaway spoke to attendees of Commodity Classic in San Antonio, taking the traditional time slot of the as yet unconfirmed Agriculture Secretary, Sonny Perdue. His remarks focuses on the upcoming Agriculture Bill. “I am committed– driven, quite frankly– to get the farm bill done on time,” Conaway emphasized. Having the rules of play locked down for the next five years is critical to growers and the creditors and bankers who help them do their job, so Conaway promised not to become bogged down by the process. He also reached out to farmers to work together and stand shoulder to shoulder when it comes time to get the new bill passed.